At the beginning of the game, enter the castle and speak to the king of Aliahan. He will charge you to defeat the archfiend Baramos and will give you some gold. Talk to the people of the castle and the town to learn lots of useful information. Enter Luisa's Place on the west end of the town. You can add the three default characters that have been pre-generated to your party or you can go upstairs and create your own characters. Speak to the lady downstairs to add the characters you just created to your party. Leave Aliahan and fight enemies nearby to raise your party's levels and to earn gold to buy better equipment. Go northwest to find the town of Reeve. You can learn more useful information here and buy better equipment. Go south from Reeve and enter the cave in the forest. Pass through the cave to get to the Tower of Najima on the island. Climb the tower to the top and a man there will give you the Thief's key. Open all the wooden doors in Aliahan and Reeve with the Thief's Key to find useful items and information. An old man in the house in the northeast corner of Reeve will give you the Magic Ball. Go west from Reeve and approach the spring. Enter the cave behind the spring. Walk up to the wall between the statues and use the Magic Ball to open a passage to the stairs. Make your way through the next area and at the bottom of the next stairs you will see three passages each blocked by a large door. Enter the left passage and use the Thief's Key to open the door. Continue down the passage and step on the travel door to teleport to a new area. Leave the shrine at the other end of the travel door and enter the castle of Romaly. Speak to the king and he will ask you to retrieve the Golden Crown which was stolen by Kandar. Go north from Romaly to the town of Kanave and then west to the Tower of Shanpane. Climb to the top of the tower and approach Kandar and his henchmen. Before you reach them, your party will fall down a hole to the level below. From this level go off the right side to catch up to Kandar. Defeat him and his henchmen. Once you defeat Kandar he will give you the Golden Crown if you let him go. Return to Romaly with the Golden Crown and give it to the king. In reward, he will make you the new king. Go to the fight ring under the weapons shop to find the king. Tell him you no longer want to be king and he will take over again. Go to the town of Noaniels north of Kanave and you will discover that all the villagers are asleep. An old man in a building in the southwest will tell you that the Dream Ruby needs to be returned to the elves. Enter the cave west of Noaniels and descend to its depths. Halfway down you will find a Healing Spring which will restore your HPs and MPs if you stand in the middle of it. In the middle of the lake at the bottom of the cave you will find the Dream Ruby and a note from the elf princess Anne who had fallen in love with a human man. Leave the cave and enter the forest square near the cave that looks different then the squares around it to find the hidden village of elves. Give the Dream Ruby to the queen and she will give you the Wake Up Powder. Return to Noaniels and use the Wake Up Powder to wake up all the villagers. From some of the villagers you will here rumers that your father had been looking for a key in Assaram. Cross the bridge east of Romaly and then go south to the town of Assaram. You'll have to bargain with the some of the shopkeepers to get better prices but even then they are over priced. Go southwest from Assaram and cross the desert to the oasis. Approach the oasis from the south to find Isis. Enter the Pyramid north of Isis. Look out for traps which will drop you down a floor. On the third level, step on the square in the southeast corner of the floor and press the button. Press the button in the southwest corner and the barrier in the center of the floor will drop. Take the Magic Key from the chest. The Magic Key can open both wooden and metal doors. You can use the Magic Key to open the door on the fourth level to find some mediocre treasures but you will have to fight Mummy Men to get them. Return to Romaly and go northwest to the shrine. Use the Magic Key to pass to the other side. Go south from there to reach the town of Portoga. Speak to the King of Portoga and he will ask you to find some Pepper from the east for him. He will give you a scroll to give to Norud the Dwarf. Enter the Cave by Assaram and read the Royal Scroll in front of Norud. He will show you the secret pass which will allow you reach the other side of the mountains. So south and then east to find the town of Baharata. You will discover that the owner of the pepper store is gone because his daughter has been kidnapped. Enter the cave northeast of the town. Go two areas south, one west, and then go south. You way will be blocked even though you can't see what is blocking it. Use the Thief's Key or the Magic Key and you will then be able to continue south then east to the stairs. Defeat Kandar's henchmen and then push the button at the south end of the hall to free the prisoners. Return north and defeat Kandar and his henchmen when they block your way. Return to Baharata and the pepper shop owner will give you the Black Pepper. Give the Black Pepper to the King of Portoga and he will give you a ship. Leave the castle and you will find it in front of you. Travel north from Baharata to find the Shrine of Dhama. Any character but the hero may change their class if they are level 20 or higher. The character will start at level 1 in their profession but will still retain some of the abilities of their previous profession. To become a Sage, you need to have the Book of Satori which is found in the Tower of Garuna. The tower is just north of the Shrine of Dhama. When you get to the second rope in the tower, jump off, then fall into the hole on the next level, and then climb down the stairs. You will find the Book of Satori in a chest. Return to Dhama with the book and put it in the inventory of the character you want to become a Sage. Speak to the priest and Sage will be one of your choices. Sail south from Baharata to find the town of Lancel on an island. Buy an Invisibility Herb from the shop. Sail north from Portoga to reach the castle of Eginbear. Use the Invisibility Herb to sneak past the guard. The Vase of Drought can be found in the basement. To reveal the passage to it, you have to move the three boulders onto the blue tiles in the back of the room. If they are numbered one to three from left to right, push #1 up once, and right twice, push #2 right once, push #1 up four times and left once. Push #3 down once, then #2 left 3 times, up once, right twice, and up four times. Finally, push #3 up once, left 4 times, up once, right twice, up three times, right once, and up once. Sail north from Muor (north of Jipang) and eventually you will find some shoals. Use the Vase of Drought and a shrine will appear. Inside you will find the Final Key. This key can open all doors including jail doors. Go to Baharata and sail along the cost. Eventually you will find the town of Jipang on an island. The people are being terrorized by a beast named Orochi which demands human sacrifices. Enter the cave next to the town and fight Orochi on the lowest level. After you beat Orochi, follow it into the portal. You will appear in the palace in Jipang and you will see that Himiko was actually Orochi. Fight Orochi one more time and you will get the Purple Orb. Sail to the village of Tedanki west of Baharata and south of Portoga and Isis. If you enter the town during the day, you will see that it has been destroyed and the villagers have been killed. If you enter during the night, however, all the villagers will be alive. Open the Jail cell at the north end of the village with the Final Key and the prisoner will give you the Green Orb. Sail to the northeast continent and enter the mouth of the river in the southwest part of it. Work your way up the river to reach the town of Soo where you will hear about the Echoing Flute. Search beneath the village well to find the Staff of Thunder. Enter the Tower of Arp to the southwest east of the town of Muor. Climb to the top of the tower and then step off the ropes toward the center. You'll drop down to the third floor where you'll find the Echoing Flute in one of the chest. When you blow the flute, you will hear an echo when one of the Orbs is nearby. At the southern tip of the eastern continent you'll find the House of Pirates. Push the boulder on the east side of the building and search the ground underneath to find a hidden stairway. At the bottom of the stairs, you'll find the Red Orb. Return to Lancel (sail south from Baharata) and use the Final Key to enter the shrine at the back of the town. The old man will only permit the hero to proceed. Follow the hallway out of the town and then enter the Navel of the Earth. Make your way down to the third level where you'll find the Blue Orb in a chest. Leave the cave and return to the town to be rejoined by your party. On the east coast of the eastern continent, you'll find a field in a forest east of Soo. There you'll find an old man who wants to build a new town. Register a new Merchant at Luisa's Place in Aliahan and have him join your party. Speak to the old man in the field and have the merchant stay with him. As time passes, the town the grow larger. Eventually, they will throw the merchant in jail for his despotic ways. Speak to him there to learn that he has buried a treasure behind his throne. Enter the building in the northwest corner of the town and search behind the throne to find the Yellow Orb. Enter the shrine northwest of Romaly, use the Final Key to open the jail door and enter the Travel Door. In the next shrine, enter the Travel Door on the right. You are now in the shrine in the kingdom of Samanao. Follow the path to Samanao. You will learn that the king has become mean and cruel. Enter the castle and use the service door on the right side to get in. Approach the king and you will be thrown in jail. Use the Final Key to open your prison cell and speak to the other inmates. Take the stairs to the lower level and in one of the cells you will find the true king. Enter the hidden passage in the west wall in the cell across from the king's and take the passage to get back to the town. Enter the cave to the southwest and descend to the second level. Enter the pit just to the south and take the Mirror of Ra from the chest. Leave the cave and return to Samanao. Enter the castle at night. Climb the northeast tower and jump off the top either to the west or the south. Enter the king's chamber and use the Mirror or Ra when facing the king. You will see the king's true form and will have to fight the Boss Troll. Once the Boss Troll is dead, the true king will be rescued from the prison and you will be able to take the Staff of Change from the chest. Sail to the frozen island north of the eastern continent and enter the field on the south side of the island. Keep going north and eventually you'll find a house. Give the old man inside the Staff of Change in return for the Sailor's Thigh Bone. Use the Sailor's Thigh Bone to track down the Phantom ship and enter it. At the south end of the lower deck, you'll find the Locket of Love in a chest. Sail down the river at the north end of the large forest northwest of Muor. As you pass the channel at the Promontory of Olivia toward a shrine on an island you will hear a voice and be pushed back. As soon as you stop, use the Locket of Love to end the curse. Sail back through the channel and enter the shrine. Search at the foot of the bed containing Simon's corpse in the southeast corner of the jail to find the Sword of Gaia. Sail south from Assaram to to where you see a large black crater. Throw the Sword of Gaia into the volcano to create a path to the south. Head south and then west and enter the Cave of Necrogond. Make your way up through the cave. On the fourth level, go east from the stairwell and drop into the pit in sight of another stairwell. You can now make your way to the cave exit. Enter the shrine near the cave exit and receive the Silver Orb from the old man there. With all six orbs in your possession, sail southwest from Lancel to a shrine on a frozen island of Liamland. Place the orbs on each of the six thrones and then talk to one of the elves and Ramia, the phoenix, will be reborn. Leave the shrine and climb on top of Ramia. You'll be able to fly anywhere in the world. Fly Ramia to the castle surrounded by mountains northeast of Romaly. Enter the castle and speak to the Dragon Queen. She will give you the Sphere of Light before passing away. Fly to Necrogond south of Isis and enter the Castle of Baramos on the island. Make your way through the castle until you finally reach Baramos. It can be a difficult fight because Baramos has a lot of powerful magic spells. Once you have defeated Baramos, cast Return to return to Aliahan and speak to the king. He will congratugate you on your victory over Baramos, but a new greater evil will make itself known. Fly to the cave on the island just east of the Castle of Baramos. You'll find that the Great Pit of Giaga has opened. Fall into the pit to enter a land of darkness. Enter the ship and land on the coast to east. Continue east to find the town of Brecconaly and the Castle of Tantegel. On the main floor of Tantegel Castle, slip in the secret room in the southeast part of the kitchen to find a stairwell leading to the Stone of Sunlight. Travel southwest from Tantegel to find the desert town of Haukness. Search the center of the bushes in the horse pasture to find the Oricon. East of Haukness you'll find the town of Cantlin. The spirit in the shrine south of the town will give you the Staff of Rain. Enter the Cave Northwest of Tantegel. Magic will not work in this cave, but you shouldn't have too much trouble if you give each character a Shield of Strength available for purchace in Haukness. Even characters who can't equip the shield can still use it in battle to cast Healmore on themselves. On the lowest level you'll find the Shield of Heroes. Sail to Kol in the northeast corner of Alefgard and search the ground five tiles south of the pool to find the Fairy Flute. Sail west of Kol and enter the tower on the island. On the third floor, fall off the north end to reach the north part of the first floor. Climb up to the fifth floor and play the Fairy Flute in front of the statue to free Rubiss who will give you the Sacred Amulet. Sail to the island in the southeast corner of Alefgard and speak to the old man in the shrine. If you have the Sacred Amulet in your possession, he will combine the Stone of Sunlight and the Staff of Rain to make the Rainbow Drop. Travel northwest from Rimuldar until you reach the point closest to the center island. Use the Rainbow Drop to create the Rainbow bridge allowing you to cross to the island and enter the Castle of Zoma. 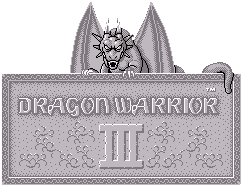 When you enter the center chamber of the 1st floor of the castle, the doors will close behind you and you won't be able to leave until you have defeat the six stone statues in three battles. Search one of the tiles behind the throne to find a stairwell leading deeper into the castle. On the fourth basement floor after crossing a bridge you will come across Ortega fighting the King Hydra. Unfortunately, he will lose and you will be unable to save your father. Be sure to enter the treasure room near the center of this floor to pick up the Sage's Stone which casts Healus everytime it is used. Continue on to the final level where you have to fight Zoma's three champions before fighting Zoma himself. The first thing you need to do in your fight against Zoma is the Sphere of Light to weaken him. Have one of your characters use the Sage's Stone every round to heal your party and if you have a Wizard, have him cast Bikill to increase your fighters' attacks. Zoma automatically recovers HPs between each round, so he can be a challenging foe if you aren't able to cause enough damage per round. Once you have defeated Zoma, leave his castle and return to Tantegel, where the king will welcome you as a hero.